The last courses of 2007 have been completed. On the 24th I completed a night dive with Ivo and Joakim, which was the last diving Instructor Specialty for both of them and with Ivo now being completely finished for his CDC program. Joakim went on to complete his EFR Instructor course yesterday, together with Gideon who is a PADI Divemaster now and who will participate in the February 2008 IDC. Today Joakim completed his DAN O2 provider course. Which was literally the last course I taught this year! 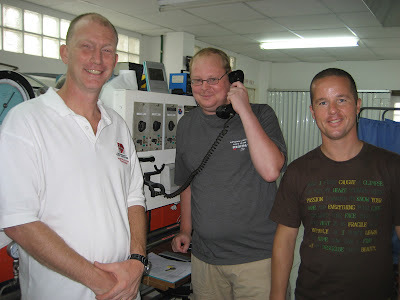 Here are myself, Joakim and Gideon, from left to right, after having completed the EFR Instructor course in front of the panel of the local recompression chamber. It's been a busy year, with 10 IDC's, over a hundred Specialty Instructor courses, well over 20 EFR Instructor courses and various other courses along the way, like DSAT Gas Blender and DSAT Gas Blender Instructor courses, Nitrox courses and DAN Oxygen courses. Thanks for following my blog this year, I most certainly hope to see you back again next year.